In chapter 2 Peter advised readers to have such good behavior that unbelievers will have nothing bad to say about the gospel. To set a good example, Christians should submit to civil authorities, and slaves should submit to their masters. In both cases, Peter uses terms that are appropriate to the first century, such as emperor and slaves. He now continues this theme by addressing wives and husbands. “Wives, in the same way submit yourselves to your own husbands so that, if any of them do not believe the word, they may be won over without words by the behavior of their wives, when they see the purity and reverence of your lives” (1 Peter 3:1-2). When Peter says “in the same way,” he means that women are to submit just as men should, each to the appropriate authorities. Citizens submit to government offices, slaves to their masters and wives to their husbands. However, this does not always mean obedience. If a husband told a wife to sin, she should not obey. Peter is speaking generally, not making an absolute rule. The point is that women should set a good example. When husbands see that Christianity causes wives to be cooperative rather than rebellious, they will be more willing to listen to the gospel, and eventually follow their wives into the faith. Peter supports this point with biblical examples: “For this is the way the holy women of the past who put their hope in God used to adorn themselves” (verse 5). They had inner beauty whether or not they had external beauty and jewelry, as some no doubt did. “They submitted themselves to their own husbands, like Sarah, who obeyed Abraham and called him her master” (verse 6; see Genesis 18:12). 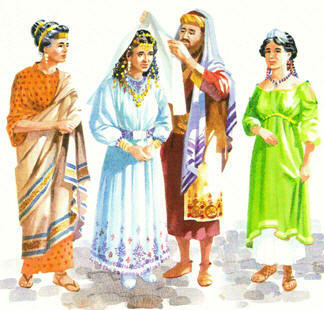 Abraham sometimes obeyed Sarah (Genesis 16:2; 21:12), but Peter is here focusing on Sarah as an example for women. Peter tells the women, “You are her daughters if you do what is right and do not give way to fear” (1 Peter 3:6). If husbands demand that wives worship Zeus, wives should do what is right, and not submit to fear. Peter gives less space to the responsibility of husbands, but what he says was unusual advice in that culture: “Husbands, in the same way be considerate as you live with your wives” (verse 7). In the same way as what? In context, it is submission. Peter encourages husbands to treat their wives “with respect as the weaker partner.” In that society, women were almost always weaker. Men were often 15 years older than their wives, more educated and more experienced. Women often married in their early teens, dropped out of school and stayed at home. Although men in that Greco-Roman culture rarely treated women with respect, Peter tells husbands to respect their wives, not be condescending. Why? Because they are equal when it comes to salvation — they are “heirs with you of the gracious gift of life.” Their value to God should make a difference in the attitude that husbands have toward them. Peter adds another reason that husbands should respect their wives: “so that nothing will hinder your prayers” (verse 7). The way we treat others affects our prayers. In verse 8, Peter gives a general appeal to all the believers: “All of you, be like-minded, be sympathetic, love one another, be compassionate and humble. Do not repay evil with evil or insult with insult. On the contrary, repay evil with blessing, because to this you were called so that you may inherit a blessing” (verses 8-9). If someone treats us wrong, we are to respond by doing good, not by getting revenge. God set the example for us by doing good to us even though we had done evil to him. Peter supports this advice by quoting Psalm 34:12-16: “Whoever would love life and see good days must keep their tongue from evil and their lips from deceitful speech. They must turn from evil and do good; they must seek peace and pursue it” (1 Peter 3:10-11). Peter has already pointed out that Jesus did not retaliate with threats against his persecutors (2:22-23); here he repeats the need for us to keep our words and our actions in control. Peter asks, “Who is going to harm you if you are eager to do good?” (3:13). Unfortunately, some people persecute those who do good, so Peter adds, “But even if you should suffer for what is right, you are blessed” (verse 14). Persecution itself is not a blessing, but God rewards those who suffer unjustly. “Always be prepared to give an answer to everyone who asks you to give the reason for the hope that you have” (verse 15). This verse — often quoted in evangelism training — is in a context of how we respond to persecution. When we are persecuted, we should not be ashamed of our faith, but be ready to explain it. The Greek word for “answer” is apologia, the word used for a defense in a court of law. Though we may be treated roughly, we are to reply without anger: “But do this with gentleness and respect, keeping a clear conscience, so that those who speak maliciously against your good behavior in Christ may be ashamed of their slander” (verses 15-16). Peter does not want Christians to give the enemy any excuse for their hatred. A gentle answer may reduce their anger by showing them that the gospel is not dangerous. Peter summarizes by saying, “For it is better, if it is God’s will, to suffer for doing good than for doing evil” (verse 17). If God brings us to a point of suffering for following Christ, then it is better to suffer unjustly than to give the persecutors evidence against us. Peter does not give enough information in verses 19-20 for us to be sure of what he means, and I will skip the lengthy (and inconclusive) debate on those verses. Peter again turns to Jesus as the supreme example of suffering without retaliation. This leads to a digression. “For Christ also suffered once for sins, the righteous for the unrighteous, to bring you to God. He was put to death in the body but made alive in the Spirit” (verse 18). We should be willing to suffer for doing good, because Christ suffered for us. Peter notes that although people killed Jesus’ body, they could not kill the Spirit (cf. Matthew 10:28). Peter comments about Noah’s ark: “In it only a few people, eight in all, were saved through water, and this water symbolizes baptism that now saves you also” (verses 20-21). People were saved by the ark, not the water. The water of baptism symbolizes death — we symbolically go into death and rise out of it. Baptism saves us not by “the removal of dirt from the body but the pledge of a clear conscience toward God” (verse 21). Baptism symbolizes cleansing, but only spiritual cleansing saves us, for salvation requires that our sins be forgiven. As a third picture, Peter says that baptism saves us “by the resurrection of Jesus Christ.” Christ’s resurrection is the power of life after death (see 1 Peter 1:3, 21). We are saved through a spiritual union with Christ, and baptism symbolizes that we have joined him in his crucifixion and resurrection (cf. Romans 6:3-4). The resurrection did not merely restore Jesus to human life — it gave him great glory. He “has gone into heaven and is at God’s right hand — with angels, authorities and powers in submission to him” (1 Peter 3:22). For aliens and strangers in Asia Minor who were being harassed for their faith in Christ, it is good news to know that he has been exalted into glory, for those who follow him into suffering will also follow him into glory!